A few years ago we were invited by Klutz, a division of Scholastic, to redesign their line of store fixtures, which had become a bit old and tired. Klutz is a publishing company that offers a premium brand of book-based activity kits aimed at educating and inspiring children. As is the case with other book publishers, Klutz carries a wide range of titles and offers newly published titles on a regular basis, which creates many challenges in designing a line of book displays and merchandising books on the display fixture. Our primary objective was to design a family of book fixtures that could meet the needs of a wide range of retailer accounts and increase sales in national chains as well as independent and specialty book stores. We designed a family of 5 fixtures. Over the last several years, we have shipped thousands of these fixtures all over the world with the majority going to the U.S., UK, Canada, Australia, and New Zealand. So the design we created had to work for both domestic and a variety of international markets as well. Our basic design objective was to create an attractive, eye-catching, fun, and economical set of book displays that ranged in size and capacity to meet the needs of large and small retailers alike. All of the fixtures were designed to be knock-down given the international shipping requirement. Importantly, the displays needed to fit as much product as possible in as small of a footprint as possible since retail space is always a key consideration, particularly among the smaller independent retailers. We wanted the fixtures to look like a family and decided on the fun colors of red and purple to attract the attention of both kids and parents. Most of the fixtures used mixed materials. The main three units were constructed of an MDF base with a purple laminate and black edge banding, a red metal tube frame, purple injection molded shelves, frosted PVC inset back panel, a metal sign holder, and a screen printed die-cut PVC sign. We incorporated subtle branding elements like an embossed Klutz logo on the front of the injection molded shelves. From an engineering standpoint, it was important to select a high-quality bearing since four of the five fixtures were designed to spin, and the weight load on the larger fixtures was significant. The main design breakthrough on the first two fixtures we designed was the pinwheel structure which enabled us to fit 25% more books on the fixture in the same footprint as compared to Klutz’s prior fixture. Once we had established the pinwheel design for the first two displays, we designed the rest of the line using lower capacity design variations. Let’s look at the five fixtures. The largest of the Klutz floor spinners was designed to be a 4-sided fixture with a pinwheel design. It was constructed of the mixed materials described earlier and featured 24 adjustable injection molded shelves. This was designed to be a high capacity fixture for large accounts. The spinning capability was important on this and other fixtures because it allowed for flexibility within the retail environment. Klutz did not know if the fixture would be placed in an area where people could access the fixture from all four sides or if it would be placed in a corner where is would have to spin to access all of the books. Second, we designed a slightly lower capacity version of the large spinner. This standard version was designed with 20 shelves instead of 24. It was intended to meet the needs of medium-sized accounts. We were careful to design as many shared parts as possible between this version and the largest version so Klutz could benefit from economies of scale in manufacturing. Third, we designed a 2-sided spinner using the same basic components. We called this the “Junior Spinner.” This unit offered a smaller footprint and included 10 shelves- half the capacity of the medium-sized spinner. The Junior Spinner was very popular among independent retailers who were space constrained. Fourth, we designed a slatwall kit to meet the needs of retailers who wanted to take advantage of available wall space to merchandise Klutz’s line of books. The slatwall kit utilized many parts that were common to the floor fixtures. It consisted of 6 injection molded plastic shelves, slatwall shelf brackets, and a screen printed PVC “header” sign with a plastic slatwall bracket affixed to the back side. Fifth, we developed a lighter weight, lower capacity, and more economical spinning wire book display. This economy spinner was constructed of metal tubing with 20 wire pockets and a 2-sided die-cut screen printed PVC header sign. 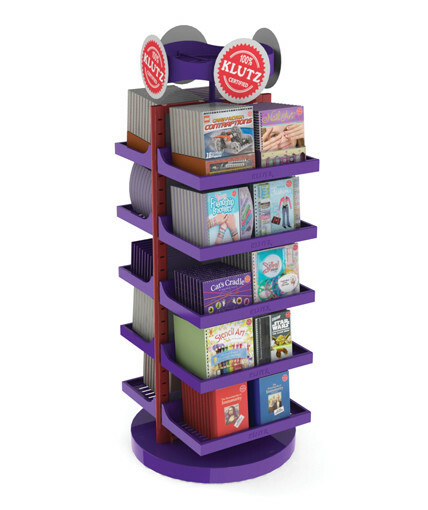 The line of book displays we designed for Klutz is a good example of a family of fixtures that can meet the needs of a wide range of retailers. Having the full line of complementary fixtures available made it possible for Klutz to sell into new accounts that might not have decided to carry Klutz’s products without a display solution that worked for them. Looking for fresh point of purchase display ideas? Interested in understanding how to maximize the impact of your retail display or store fixture program? Subscribe today for free and we'll share what we've learned from over 25 years of industry experience.